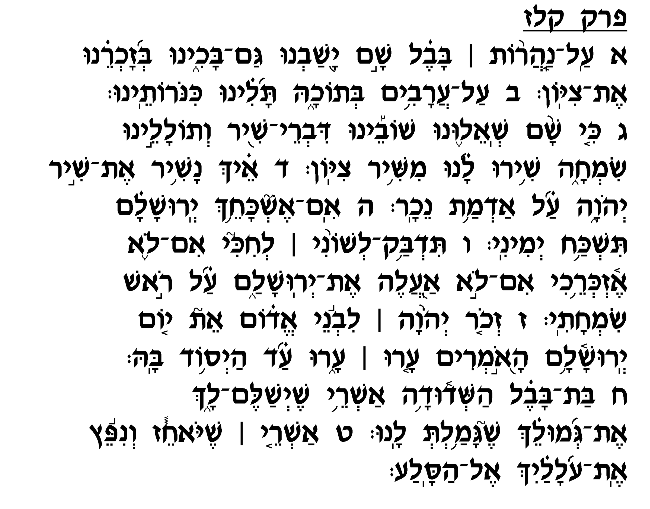 This Psalm, which is among the more famous chapters of Tehillim, presents a stirring, heart-rending description of the Jews' mournful journey from <?xml:namespace prefix = st1 ns = "urn:schemas-microsoft-com:office:smarttags" />Israel during the Babylonian exile. The Levi'im, who had served as the musicians and singers accompanying the ritual service in the Bet Ha'mikdash, were asked by the Babylonian captors to provide musical entertainment as they rested along the riverbanks on the way to Babylonia. But the Levi'im refused, rhetorically asking, "How can we sing the songs of God on foreign land?" (verse 4). The Levi'im then added a vow never to forget the city of Jerusalem, never to allow their residence on foreign soil to detach them from their spiritual roots. Even "upon the head of my joy," during the most joyous, festive occasions of life, their rejoicing is tempered by the destruction of Jerusalem, and by the Jewish people's state of exile. These timeless verses (5-6), perhaps more so than any passage in the entire Tanach, has served as a constant reminder to the Jewish people throughout the ages never to feel entirely at home or at ease while living on foreign soil. No matter how comfortable Jews have grown under non-Jewish rule, Psalm 137 has exhorted them to always remember Jerusalem and look to that city as their spiritual home and future destiny. In this chapter's final three verses, the Psalmist expresses his hope and prayer for the eventual downfall of the enemy nations that razed the city of Jerusalem and mercilessly persecuted its inhabitants. The wish expressed in the final verse is unusually graphic, perhaps even jarring, but can be understood in light of the pain and suffering that Babylonia inflicted upon the Jewish people during this most dreadful chapter of our nation's history. 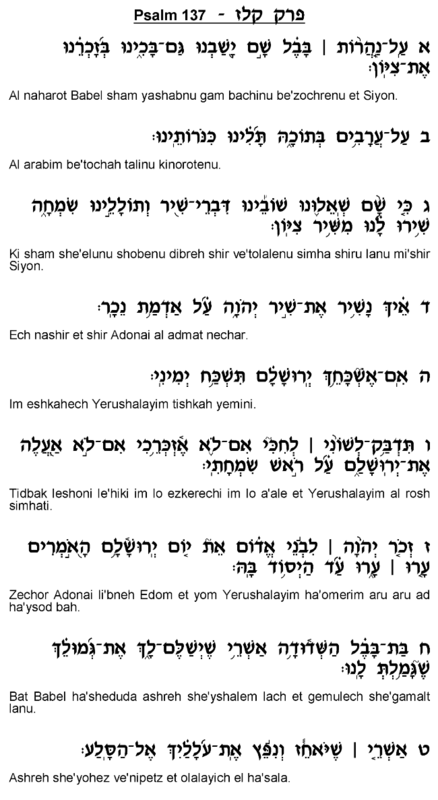 The Psalmist wishes upon the Babylonian Empire and its accomplices the same kind of torment and destruction it visited upon the Jewish people, and looks forward to the day when the Levi'im will again sing the "song of God" in the rebuilt Temple in the presence of both the reunited Jewish people and the Shechina.